By providing a variety of interest tracks (creative arts/performing arts/sports), children (3 years -6th grade) can explore their talents and natural abilities and discover what it means to trust in Jesus’ love every day. Registration is now closed. "Shipwrecked - Rescued by Jesus"
"The righteous person faces many troubles, but the Lord comes to the rescue each time." Visit the Volunteer Job Board in the North wing of the Creekside Atrium on Sunday mornings or register online click here to sign up. Complete the information in the boxes provided and Sherry Ju will contact you. 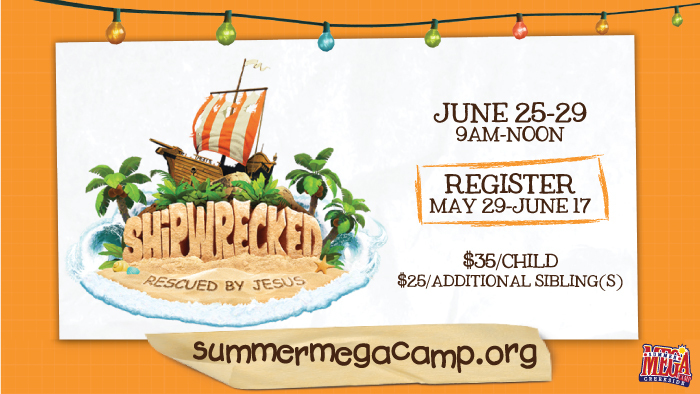 Note: Free childcare will be provided for the babies and toddlers of all Mega Camp volunteers during the week of Mega Camp.